Written by 6/26/2009Share this story on Facebook! And be sure to let us know what you'd like to see in future issues and online. Remember, we encourage you to comment on any Fuse story online any time. Our student staff is looking forward to your comments and questions and is ready to talk to you about all aspects of the Ithaca experience. So go ahead: comment below to start the discussion now! Well i am about to be a junior in high school, and i just got this issue today. 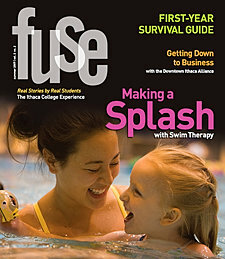 This summer issue of Fuse really made me want to come to this college. Thanks so much! We're glad you're enjoying Fuse. Be sure to check out the web exclusives and future issues! I am really interested in the Fuse article entitled "Mainstream Media and the Future of News". This article introduced me to Lester Holt, who I have recently contacted with questions about changes in reporting news. It also was interesting to read the article "Bloody Good TV". I found it comforting to read about Ithaca Students who have had success in the "real world". It's great to see that Ithaca offers great opportunities like this. I thought the issue was very well done. I enjoyed reading what people thought of the first year and learning on "how to survive it". I also enjoyed the layout and design of the issue. This issue of Fuse is very informative. It definitely gives the reader a comprehensive view of what is going on at Ithaca College in the music world. As a rising High School Senior I appreciate all the information I can get to make the right decision about college. Ithaca looks like a great place to learn and grow. I am very interested in Ithaca, in fact it is one of the top on my list and seeing this issue of Fuse was so enjoyable and makes me look forward to my visit later in the summer! The issue was so interesting and I am so excited to see this college! Great new issue of fuse. I was particularly interested in the article about Christie and her internship with Tommy Hilfiger. That is quite an extraordinary experience to have first hand business experience with a popular brand name. Keep up the good work and I anticipate my visit to Ithaca in the near future! I am going to be a senior in high school and this issue was very helpful. I can't wait until i can visit Ithaca soon! I really enjoyed this issue of Fuse! I felt that the articles were interesting and covered a broad range of topics. This summers issue of the Fuse was great. It was my first experience with the magazine. It really opened my eyes to the types of opportunities that Ithaca offers. This issue covered a good roster of topics with the readers interests in mind. Good job guys!! I enjoy all the issues of Fuse in general and this one especially. I am about to enter my senior year of high school, and this issue made me even more excited to visit Ithaca! Thank You! i really enjoyed this article of fuse. i especially liked the first year survival guide i really think that will help with my first year. keep up the great work. I enjoyed this issue of fuse, especially the survival guide. It gave me a great amount of information especially about what Karin said about how Ithaca is a good place to take things at your own pace.